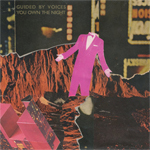 Original release info: With the recent Space Gun, Guided By Voices has focused on just a single album per year while touring the new songs across America throughout 2018. That doesn't mean that the ultra-prolific Robert Pollard is vacationing or sunning himself by the pool. Here's a 7" vinyl preview of the insanely anthemic "You Own the Night" (from the forthcoming February 2019 double album Zeppelin Over China) backed with "Your Cricket is Rather Unique" (from the forthcoming February 2020 album Street Party). The single is a limited edition of 1000 - just 300 copies going to retail.